These 3mm LEDs are of the "slow-changing" variety, meaning they cycle at a rate of one color every few seconds. Craft a paper circuit pop up card with a cycling RGB LED, battery, and copper tape. How to assemble and use the Cherry MX Switch Breakout, allowing you to turn a matrix of mechanical switches into a full-size keyboard! 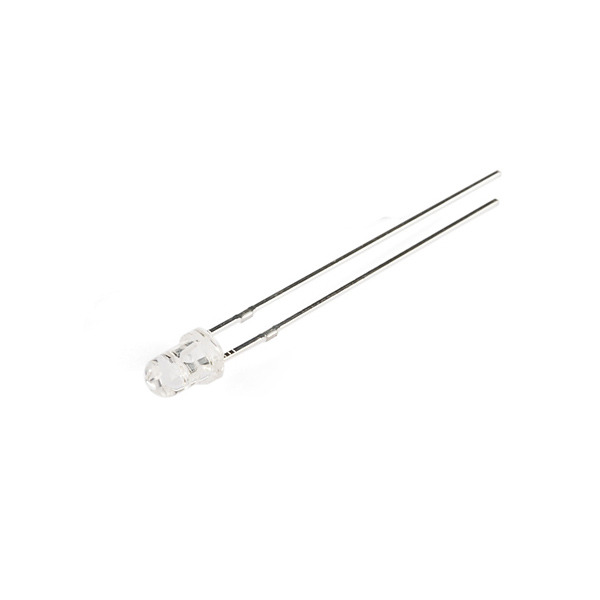 The legs on this LED measure 1.14 inches and 1.08 inches. The shop description says cycles 'every few seconds', and Nykin says '37 seconds to cycle through each color'. Can someone resolve those two descriptions for me ? And tell me how fast the 'fast' ones are ? I realise there will be a range with individual samples, but 37 seems a long way from 'a few'. Thanks. OK, I can answer my own question now I have the LEDS - they cycle 4 or 5 seconds per colour, so Nykin meant 37 seconds through every colour variation. The tolerance between individuals is big enough that they are typically out of phase by the time they have done a compete cycle of all colours. Which happens to be good for my project. 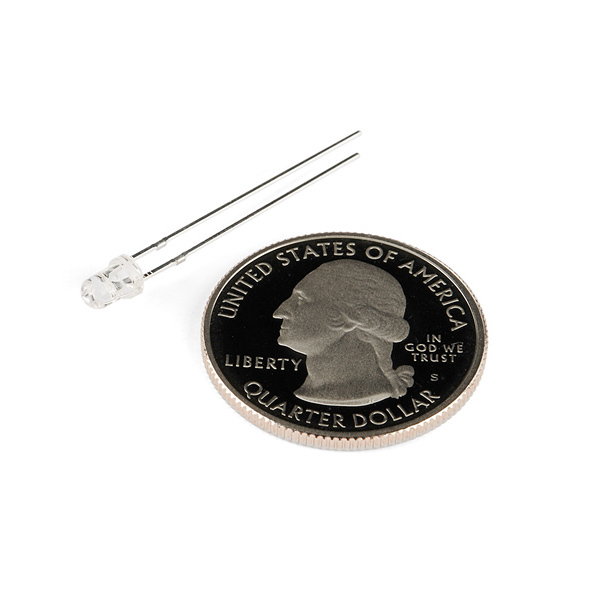 What's the right resistor if we use it with coin battery (3V) such as CR1225 or CR 2032? and how long would they last? thank you for your help in advance. If you're using a 3V coin cell battery, you technically wouldn't need to use a resistor (these batteries have enough internal resistance to limit things safely). You can use a resistor to reduce current draw, which would affect the battery lifetime, but also affects the brightness of the LED (which is likely to affect the blue color first). For guesstimates on battery life for these sorts of things, try searching for 'led throwie' - one I tested ran about 5 days before it got markedly more yellowish) - but ultimately it will depend on what resistor (if any) you use. anyone knows how cr1220/1225 or cr 2032 would last with this led? and do we also have to use a resistor for it? Thanks! Just received a pack of 10. I timed a single one and it takes about 37 seconds to cycle through each color. There is some variation on timing for each unit. The colors go red, green, blue, yellow, cyan, pink/purple, white, and then repeat. I'm powering the LED from a single ATtiny85 pin, with regulated 3.3 volts, so a 68 ohm resistor is used and this little guy is bright! I tried a 1.5k resistor and the blue and maybe green elements do not light up, as one might guess. A magic eraser works okay to diffuse the light a little, but I'll probably grab some sandpaper and rough it up better to give a softer and more uniform appearance. Maybe obvious, but blinking and PWMing does not allow the integrated IC to cycle through colors, even if one uses AnalogWrite with a relatively high value like 240 (of 255). This is sort of neat though, because as it will still fade or blink red as a status indicator, the color changing becomes like a secret that only activates when you just leave the pin it's attached to high, understatedly cool. The blue element in one started flickering and gave out relatively quickly, but I can't confidently say it was defective based on some of the stress testing I initially put it through. I'm going to use these with a cutesy board using the aforementioned uC I'm making to give out to friends. Rainbows are cool. If anything you can hot glue a bunch of optical fibers to the top and make a soothing little tree thing. I feel like those things have a therapeutic element that appeals to anyone who tends to fall asleep with the TV on. I don't do that but I still like them. Anyone know where I can find an SMD version of this? I asked an acquaintance at Philips on this - he replied saying he's not an expert (they don't really do autocycle RGB LEDs) but asked around and nobody knows of any retail SMDs. 10mm, 8mm, 5mm, 3mm in these packages, and 5mm, 3mm (lens size) in superflux/piranha packages are all they know of. Once you go further down for individual LEDs, you're looking at either off-the-shelf RGB SMD LEDs being driven by a tiny microcontroller off the side, or individual R, G and B emitters wired straight to the board (and a blob of clear epoxy dabbed on top of them) driven by a tiny microcontroller itself directly wired to the board (with regular ol' epoxy/cement on top). So if you wanted to make something like that yourself, you'd have to pick up an SMD RGB LED and a tiny microcontroller (apparently people have done this sort of thing even with a 6-pin ATtiny10!) and wire those up.